If you like tales of enchanted eels, thwarted love, saintly devotion and vengeance, the history of St Dwynwen on Llanddwyn Island (Ynys Llanddwyn) in north Wales might interest you. 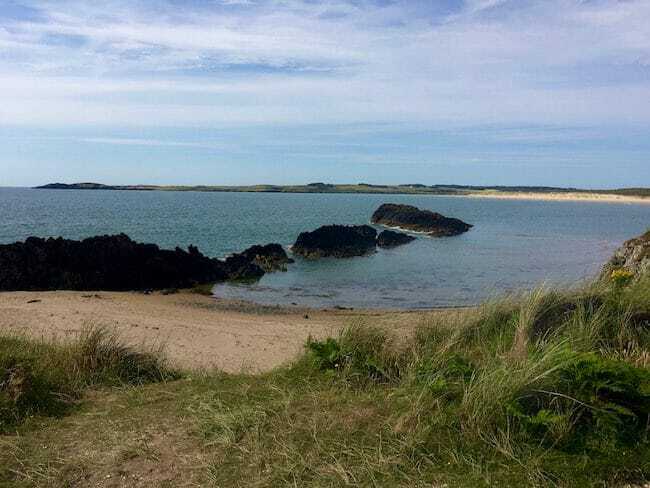 To learn more about St Dwynwen, the Welsh patron saint of lovers, or if you want to visit this tiny island near Newborough Beach for yourself, read on. Ynys Llanddwyn (Llanddwyn Island) is a lonely place. It can’t even be properly considered an island except at high tide. Otherwise you can walk there from Newborough Forest. It’s said to be one of the most mystical places in Wales, but as I walk through the forest from the car park then along the curved crescent of Newborough Beach with Robert Jones of Visit Wales, it’s not easy to get my head around St Dwynwen’s tale of love, devotion, magic and vengeance. Sacred places – at least in Wales – are not all happy fairytales, and this one is a head spinner. Dwynwen was a 5th-century princess. That much we know for sure. She loved a man named Maelon Daffodrill but agreed to marry someone else, probably at the orders of her father, King Brychan Brycheiniog. As King Brychan Brycheiniog had somewhere between 24 and 36 daughters, depending on which version of the story you believe, you wouldn’t think he’d care much who Dwynwen married, but there is no predicting the thought processes of a king. Maelon Daffodrill, who sounds so lovely and bright because his name practically spells daffodil, didn’t take the news in a bright and cheery fashion at all. He was so angry he attacked (many say raped) Dwynwen, ruining her dreams of pure innocent love forever. So how did Dwynwen become the Welsh patron saint of lovers? Other women who wanted to devote their lives to God came to join her, and the cult of St Dwynwen on Llanddwyn Island was born. 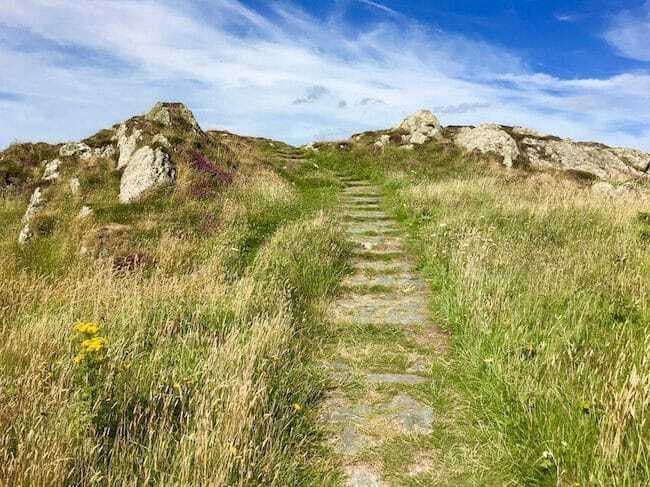 The slim finger-shaped island became a popular pilgrimage destination, and today, people in Wales celebrate St Dwynwen’s Day on January 25th, making it the Welsh version of Valentine’s Day. So now I’m standing on Llanddwyn Island for myself. It’s a rocky island formed by some of the oldest rock in Great Britain, ancient Precambrian rock that billowed up as lava when tectonic plates collided deep below the sea. Overtop, like a wispy skin, floats a layer of scrub and grasses and wildflowers. Robert and I stop at the husk of Dwynwen’s Church, a 16th-century building probably built on the site of her original chapel. 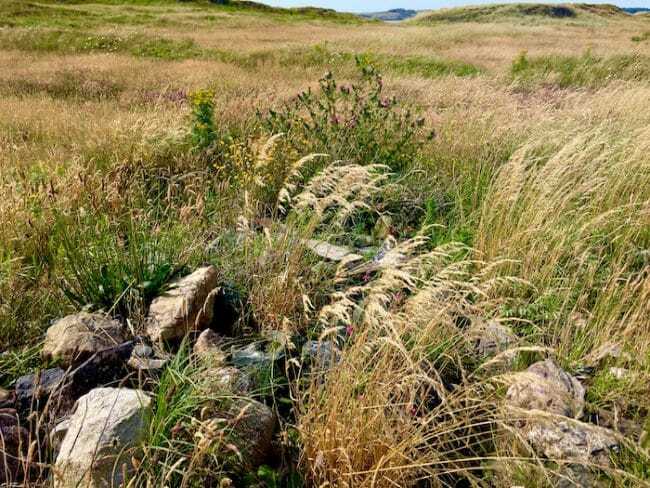 A broken wall forms a stone picture frame against the windswept grasses and bluebells, and I look out over the same views St Dwynwen must have seen: Snowdonia in the distance and the glassy waves of the Irish Sea. “Where’s the well?” I ask Robert. One of the biggest draws to the island, especially in the Middle Ages, was a holy well. It was believed that a lover’s faithfulness could be divined through the movements of the magical eels that lived inside. It’s long grown over, he explains, pointing out the faint trace of an uneven circle of rocks. Then, as he heads back to Newborough Beach, I linger, weaving my way through the scrub to the well. I want to get a sense of why the island has become such a sacred destination and why, over the centuries, thousands of people hoping for love, nursing broken hearts or wanting to know if their partners have been unfaithful, have come to seek out Saint Dwynwen on Llanddwyn Island. Perching on a stone that marks the outline of the well, hoping curses aren’t going to start flying out at me like screeching crows, I try to picture Dwynwen standing here, howling her bitter curses down at Maelon Daffodrill. It’s so at odds with her otherwise saintly behaviour, but that’s what makes the story so compelling and complex. I don’t feel any remnants of evil spirits seeping out of the soil, and no eels or snakes come slithering out of the ground carrying dark poisonous spells. It’s tremendously tranquil, and I like the fact that wildflowers have grown over the curse-strewn well, as if the curses have burrowed their way back deep into the dark ancient rock, while St Dwynden now lies at peace. First, I have to say there are many versions of this story and I’ve tried to cobble together a composite as best I can. 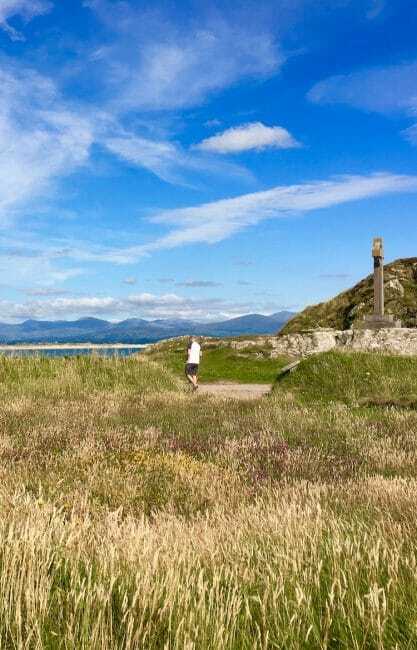 All seem to agree St Dwynwen was a real princess (some say Welsh, some say Irish) of the 5th century, that she came to live on Llanddwyn Island as a hermit and that Ynys Llanddwyn became a popular pilgrimage spot, especially for the lovelorn or those celebrating love. Note: There is also some dispute as to the location of the well so, hey, if it’s in a different location there might be some enchanted eels left after all. Both the village of Newborough and Newborough Beach are located on the southwestern edge of the Isle of Anglesey in northwestern Wales. To get to Newborough Beach turn left out of Cerrig y Barcud, and head up to Newborough Road at the top of the lane. Turn left and follow this road to Newborough (Niwbwrch) village. Turn left at the crossroads and you’ll come to a toll stop. There is a cost of £4 to enter, then you can drive through the forest to the main car park. 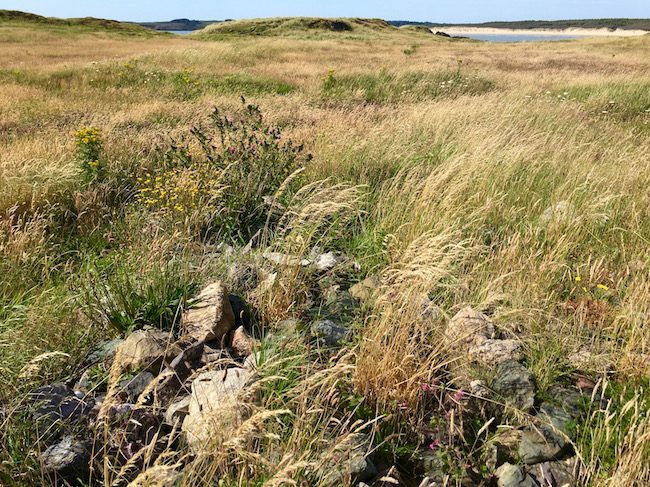 Newborough Forest and Llanddwyn Island are part of the Newborough Warren National Nature Reserve, a diverse area with forest, sand dunes, mud flats, salt marshes and beaches. It’s a popular birdwatching area, and you might see sandpipers, cormorants, shags and oystercatchers. You might also spot sheep, wild ponies, or the elusive red squirrel. 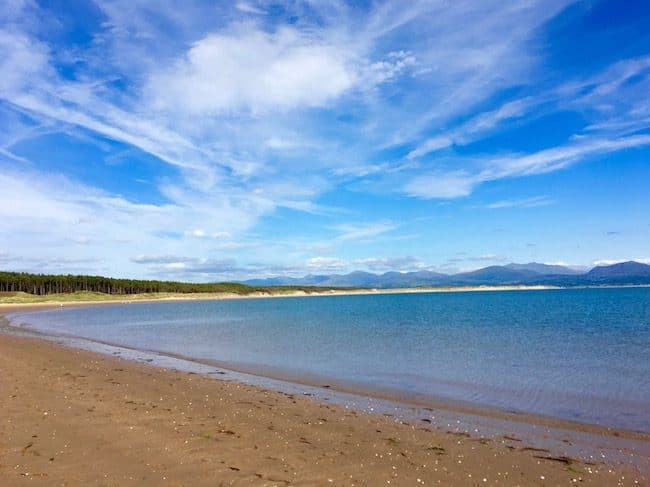 Newborough Beach is a blue flag beach and has toilet facilities. 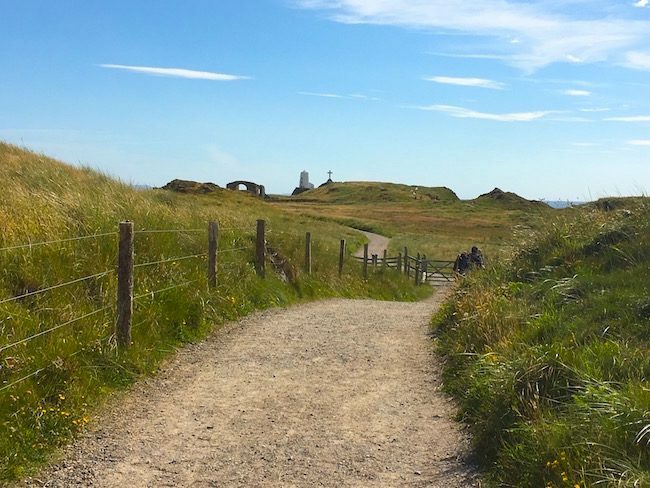 In addition to tracing the history of St Dwynwen on Llanddwyn Island, there are a few sights to see. The island sits at a strategic position near the southern entrance to the Menai Straits, and has two historic lighthouses. One, built in 1845, is shaped like an Anglesey Windmill. There is also a terrace of pilots’ cottages that houses a small free museum. The cottages were inhabited by the pilots whose job was to guide ships into the Strait. There are some small coves and quiet beaches, but no facilities so bring water and snacks. Try the Bull’s Head Inn in Beaumaris, a small town with an impressive unfinished castle. Castle Street, Isle of Anglesey LL58 8AP. Slightly further afield is the delightful faux Italianate village of Portmeirion filled with whimsical follies, statues, fountains, gardens and tourist accommodation. It has a wide range of various self-catering cottages, a main hotel and even a castle. Travelling around North Wales? Check out the fascinating history of Conwy Castle in the scenic town of Conwy. My trip was organized by Visit Wales and Visit Britain. All opinions and fascination with enchanted eels are my own. Read more about Mystical Places. Read more about top European destinations. If myths were to be true – its quite a story! Lovely pictures you have there and I also like the way you did the break down of this post. Well written! Wow, what a story! 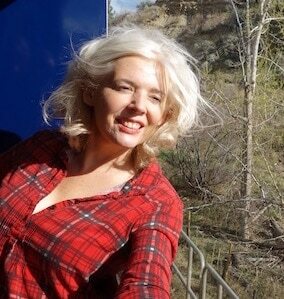 The views and landscape is stunning though. I have to be honest, I had no idea this place existed but it’s great to hear about it in such an entertaining way :D I can just imagine the underwhelming feeling you must have got when you got to the well. I would say low tide is the best time to visit Llanddwyn Island, Claudia, when it’s connected to Newborough Beach. Thanks for saying so, Andrew. I hope you manage to track down St Dwynwen on Llanddwyn Island for yourselves. 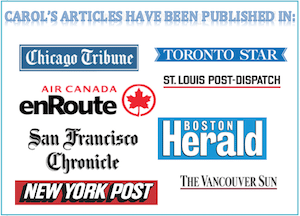 How interesting! I never knew the history of Wales. It looks like a beautiful place to visit. 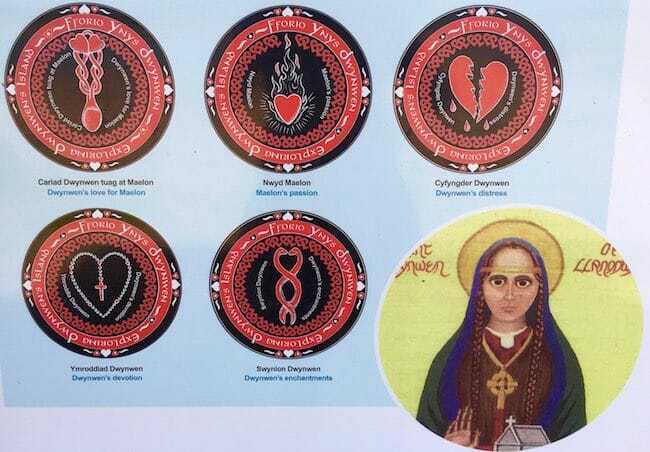 That’s a fascinating story about St. Dwynwen. We loved exploring Wales, we missed Llanddwyn Island and would love to travel there soon and hear the mystical stories there ourselves. It’s such a beautiful place, thanks for the recommendation. That is so interesting that it actually becomes an island on high tide. I think that information alone makes me want to visit ! I am not sure which one is better on high or low tide, maybe low tide so you can walk there?